Hi! 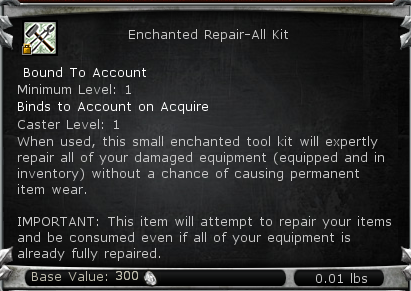 So this weeks coupon code REPAIRALLKIT can be used to get Enchanted Repair-All Kit. What is so special about it you ask? Well, if you use the item from your inventory while dead (<- this is an important part btw) it will repair all your items and will not be consumed. Great item to have while raiding or reapering, make sure to get it!